Out of 33,219 finishers of this year’s Shamrock Shuffle I am sure there were many who were experiencing this event for the first time, just as I was. The Shuffle is the world’s largest 8K! 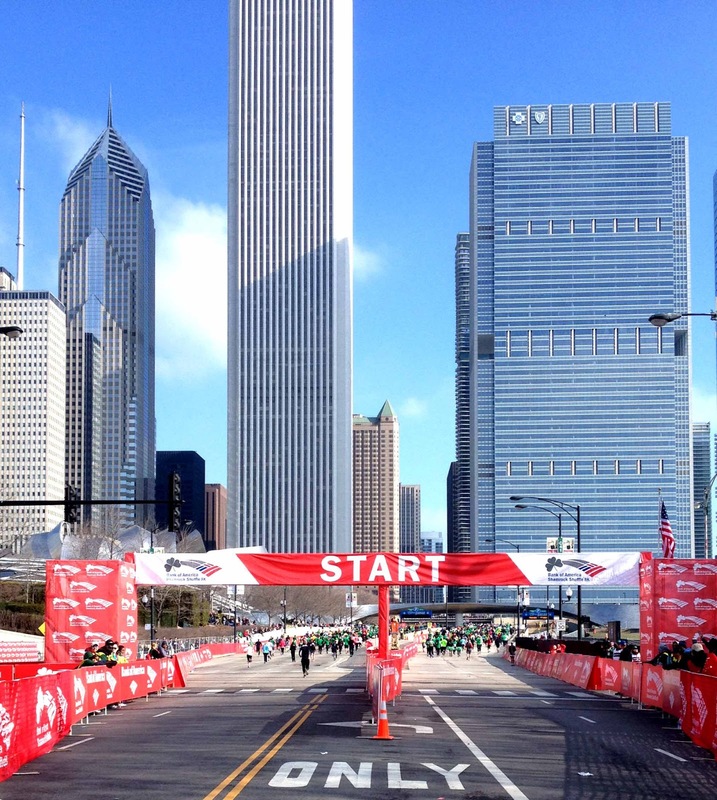 It is quite a sight to see so many major Chicago streets closed off from traffic and populated by runners from around the globe. Waiting around before a race early in the season (or late in the season for that matter) is always a bit chilly. Fortunately, just as the starting horn was about fifteen minutes from releasing the runners from Wave 1, Corral A, the sun popped out from behinds the clouds as if it too had heard that the corrals were closing and it needed to show up, toe the line, and prepare for the starting ‘gun’. What was a decent morning with a cold breeze, became a cool, refreshing morning with the sun on our faces, perfect for a run. Two. One for wave 1 participants, one for wave 2 participants. Plenty of staff. Well organized. Two large waves separated by about fifteen minutes from the end of the first wave. Smaller release waves (corral waves), separated by five minute intervals. In addition to the wide streets being closed off, the corral releases turned out to be a good match for the volume of people as well as the terrain. From back in Corral E, where I was penned, I never caught up to any congestion on the course, no matter how many people I passed. Another factor in this may have been that they filled some of the more advanced corrals (A-D) with people who would normally have not qualified for them. This helped to even out the waves so that an already fast corral (I.E. A, B etc.) who probably wouldn’t need a five minute head start to avoid people catching up to them, would still be more occupied that it would have been with only people who ran a five minute mile. This was also true of many of the corrals, including my own. 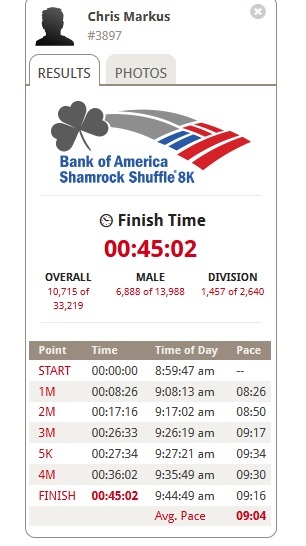 I have never run Shamrock before and so I did not have an official qualifying time. This should have placed me in corral F or even farther back. Instead, in order to ensure that the corrals were adequately filled to best use the allotted five minute lead time, runners with slower or no official times were moved up to ‘faster’ corrals. This seemed to work well for at least corrals A-F as I know a runner in F who had no official time and so he was placed in corral F instead of A, where he likely should have been, given he ran the Shuffle in just over 34 min. No congestion slowed him down. After crossing the finish line, as always it got a bit congested with people either start walking immediately after they finish or stoping altogether. Nothing unexpected here and it wasn’t as terrible as a few finish lines I’ve seen in the past. Treats were bananas (Yay! ), Sunchips, a granola bar, and a Twix. My only criticism of the finish line was that after the Gatorade stands, which were located a reasonable distance from the finish line to prevent people from stopping immediately after finishing, the water stands were so far down that people were frustrated looking for them. Some runners turned back, thinking that water must have also been served at the Gatorade stands because this was oddly far away to place a water stand. Eventually, after yet more walking, stands of friendly volunteers stood handing out water bottles and all was forgiven. Afterwards, I successfully found my friends, grabbed a free beer (also well set up, no real lines, just people huddled around the beer stands that appeared like a line) and sat down on a bench to chat about what everyone thought of the race and how they did. I’ve never done the race before, but I will definitely be signing up again next year! 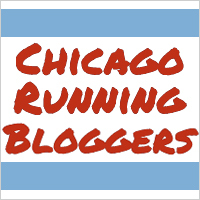 Thanks for everything Volunteers, Organizers, Participants, and City of Chicago!